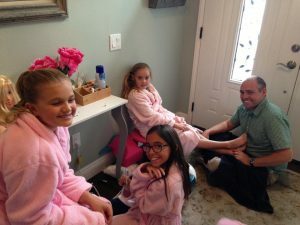 Since a lot of you baby boomers will be spending extra time with your grandchildren over the holidays, why not create a special spa day with your granddaughters right at home? 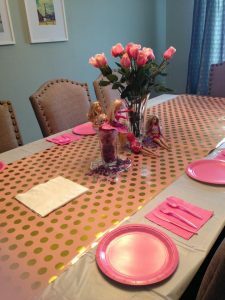 We did this with a Barbie theme over the Thanksgiving week that the kids had off school. My granddaughters, ages 9 and 5, along with my niece and their friend, both 10, loved it! 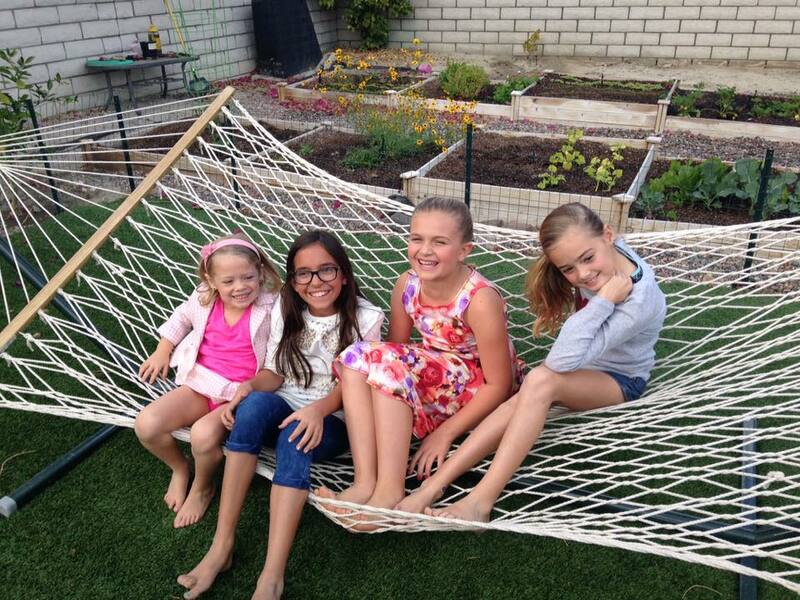 My two granddaughters, niece, and friend before the Barbie spa party began. Another perk: This idea works well if you’re on a budget. Many of the party decorations we used were purchased at the dollar store. I have to confess, their Daddy did most of the planning and shopping for the party. And yes, my son is an amazing father and a good sport! He took the girls to the dollar store where they purchased $3 pink fluffy robes that were super soft and cozy, very pink paper plates, plastic silverware, and napkins, a table cloth, balloons, and some gift wrapping. 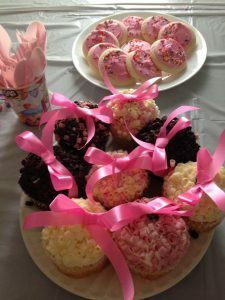 We decorated the table with those items along with some pink roses and cookies my sister provided for the event and special cupcakes a mother of one of the guests kindly brought. Most the decorations for the table came from the dollar store. Cookies and cupcakes my sister and a mother of one of the guests provided. The children and their father created a photo booth from a cardboard box. They decorated it with wrapping paper, pink napkins, and free online printables. We added a basket full of funny party glasses, feather boas, princess crowns, and plastic jewelry the kids already had in a costume drawer and viola! The girls were ready to start posing. 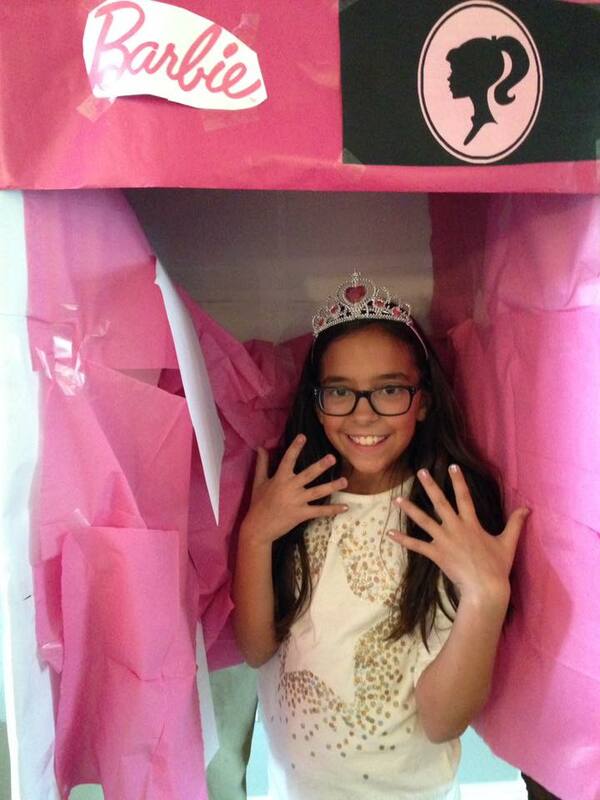 My niece posing in the Barbie photo booth. 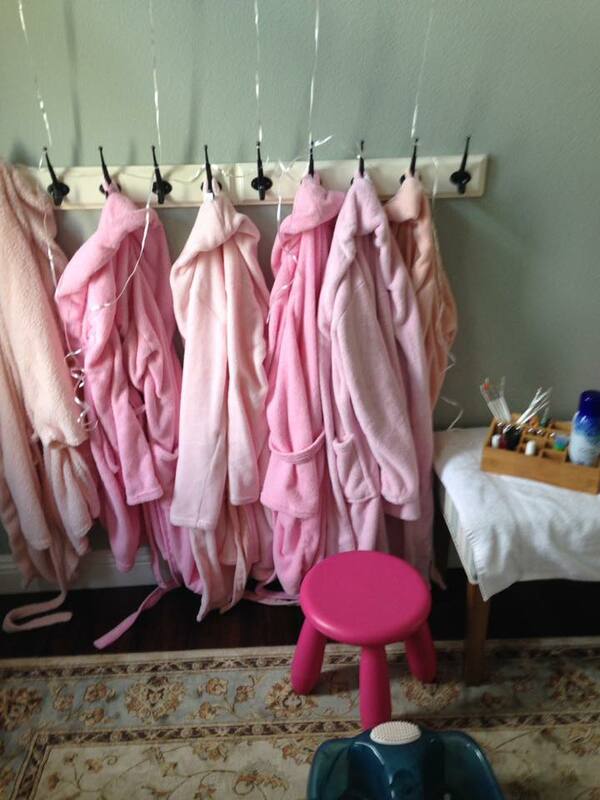 The fluffy pink robes purchased for only $3 at the dollar store. After taking their photos, the girls strutted down the runway in a fashion show. 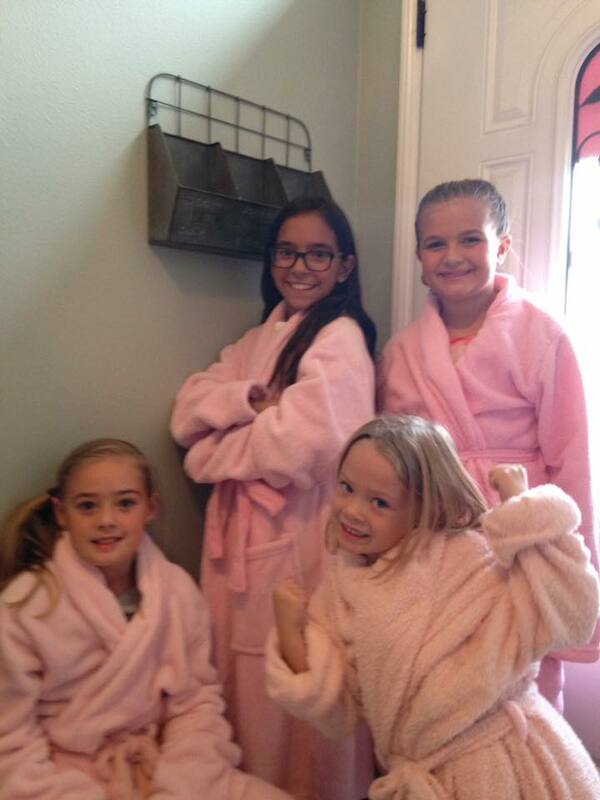 Then it was off to the “spa” we created in the entryway with the pink robes, pink balloons tied with black ribbons, a foot spa machine, plenty of nail polish, a pink stool from the girl’s bedroom, and a couple of white fluffy towels. We also put a Barbie styling head doll the girls already owned on a table so they could have fun putting makeup and styling Barbie’s hair while they waited for their turn. Daddy happens to be a great manicurist, so he did the honors. The girls decked out in their pink robes. We played some fun upbeat music and let the beauty fest begin! I brought out some of my makeup and they had fun putting it on each other as well as styling each other’s hair. They even did my makeup. Grandpa didn’t get a manicure, but he made the girls laugh with a 70’s style dance. 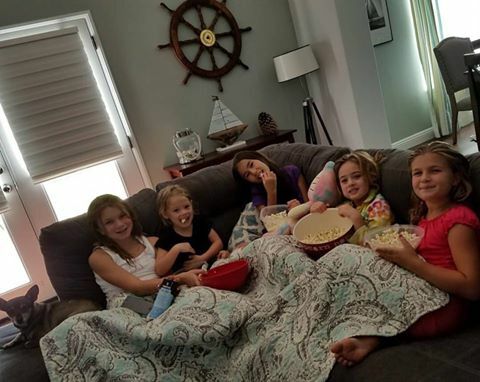 After the pampering, the girls ate pizza and then it was movie time. We provided the girls with popcorn and pink lemonade with fancy straws and black ribbons tied around the glasses. 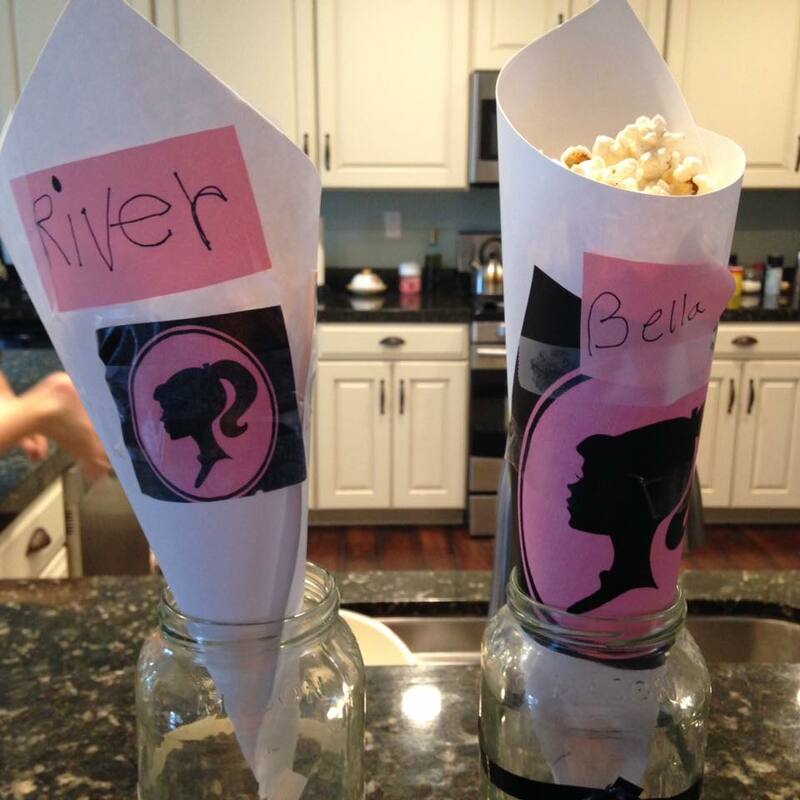 The popcorn holders were super simple to make. I bought a large white cardboard sheet and cut it into five pieces. Then I twisted each one and stapled them at the bottom. We used some more free printables for decoration and added the girls’ names. My granddaughters had fun helping me make them. The girls watched (what else?) a Barbie movie. A good time was had by all. If you want to have a Barbie spa party, check out this site where I got some of my ideas. If you want, you could add facials, masks, shoulder massages with aromatherapy oils, or even learn about reflexology together and practice on your feet. The best part is being able to spend some quality time with your granddaughters. So try it out. Create a luxurious spa day at home and enjoy! This entry was posted in Grandchildren on December 1, 2016 by juliegorges. Can’t afford that pricey vacation to Disney World with the children or grandchildren? 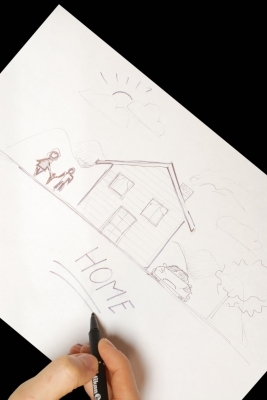 A new study from Baylor University points out that family happiness is often found right at home. If you’re a baby boomer like me, as a kid, you probably spent a lot of time at home eating family dinners, playing board games, and watching “Mutual of Omaha’s Wild Kingdom” and “Wonderful World of Disney” every Sunday night. But have you noticed that today’s exhausted families seem to be constantly on the run dashing from one destination to another? Turns out our parents may have been on to something back in the day. Sure, it’s fun and exciting to go new places and create memories. But simply hanging around the house enjoying familiar activities also has its benefits. In fact, this new study points out that leisure time spent at home may actually be a more effective way to foster true, long-lasting happiness. “When the brain is focused on processing new information—such as taking part in an unfamiliar activity with unfamiliar people in a new location—less ‘brain power’ is available to focus on the family relationships,” lead author Karen K. Melton, PhD., assistant professor of child and family studies, said in a press release. In other words, a quiet evening spent together participating in familiar activities inside the home – while reducing distractions such as cell phones – makes it easier to reap the emotional benefits of quality time together. Family members can feel free to “express stress and conflict as well as pleasure during leisure time” if they’re at home, Melton added. This necessary and natural process of blowing off steam that can lead to solving family issues is something that probably won’t happen in public places where people are watching. Although many experts recommend eating together and discourage watching TV, Melton said there is not a one-size-fits-all schedule for leisure activities that guarantees happiness. This idea also fits into studies that show children do well with regular, predictable, and consistent routines at home. That’s good news both for parents and grandparents limited on time and resources. If you’re a grandparent like me, that means when the grandchildren come to visit, you don’t have to feel the need to run out and do something new and exciting every day. Quit trying so hard, slow down, and enjoy simple activities at home with the children. Read a favorite book and have your child or grandchild add his own twist for a unique ending. Have some old-fashioned fun in the backyard. My grandchildren love to play “Eat it or Wear It” with various foods. Want something tamer and less gross? Try good ol’ Freeze Tag, Kick the Can, or Red Light Green Light. They’ll love it! Make an obstacle course. Or pick up a piece of rain gutter at the hardware store, add water and a soap “boat” and voila! You have a race track. Grandma and Grandpa, show the kids some of your groovy moves during the disco era. Dim the lights and give each child a flashlight to turn on and off for that full disco effect. Break out your old Bee Gee, ABBA, and KC and the Sunshine Band albums. Or younger parents, share your favorite dance moves like the Sprinkler, The Macarena, or the Robot with MC Hammer or New Kids on the Block playing in the background. Or choreograph a dance routine to your kids’ current favorite songs. Ready for some quiet time? Lie on a blanket outside and do some star gazing. Do a puzzle together. Make a shoe box dollhouse using cardboard, matchboxes, toilet paper rolls, and scrapbook paper (I spent countless hours doing this as a kid!). Remember string art and play dough? They still work like magic! Kids love to perform. Hold a family karaoke night. Give out “awards” for the silliest performance, best duo, most dramatic voice, or best outfit. Make a “runway” out of folded blankets, play some music, and have a fashion show with exaggerated catwalks and poses. Try a comedy show complete with corny kids jokes, a puppet show based on the children’s favorite story, or a magic show displaying their favorite card tricks. Save money and take the time to veg out at home. In the long run, your children or grandchildren may be happier! Images courtesy of digital art and graur codrin at FreeDigitalPhotos.net. This entry was posted in Grandchildren, Happiness, Relationships on October 20, 2016 by juliegorges. I spent most of this week at court with my son finalizing his divorce and custody case. Unfortunately, it was a tumultuous divorce, but it is done and now is the time for everyone to move forward. Divorce was foreign territory to me. My husband and I have been fortunate to be married for 38 years. My parents were married for almost 60 years before my Mom died last summer. This, in fact, is the first divorce in our family. So, questions danced around my head while going through this process. Should I ask my grandchildren if they want to discuss their feelings about the divorce? If they don’t bring it up, should I? How could I provide a low stress environment for my grandchildren to help them escape the drama? What could I do to help them feel secure and optimistic about the future? Surprisingly, my grandchildren rarely mentioned the divorce. If this is the case with your grandchildren, does this mean you should bring it up? Experts say no. A grandparent’s responsibility is to provide a loving, safe, and secure haven, not spend time investigating and delving into the children’s thoughts and feelings about the divorce. 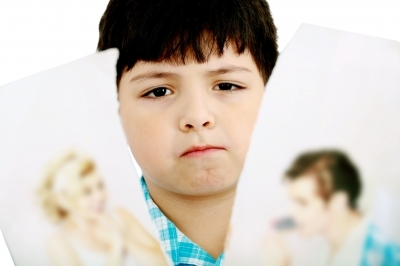 What if the children bring up the subject of divorce? Experts advice to listen attentively, reassure them that the divorce wasn’t their fault, offer lots of love and hugs, and express your sympathy. But be careful what you say. You may be experiencing some of the same feelings as your grandchildren including stress, disappointment, anger, and disillusionment, so it’s easy to be empathetic. However, resist the temptation to express your own feelings which can make the children feel like they must comfort and support you. Do not badmouth the children’s parents. This includes sarcastic remarks that you think are going above the children’s heads. Kids are smarter than you think. Remember, children are all ears, so avoid discussing the divorce when they are nearby. No matter what your personal opinions are, remember that your grandchildren love both of their parents. Strive to make the children’s time with you low-key and relaxing. Instead of focusing on the children’s parents disintegrating relationship, keep the focus on your loving relationship with your grandchildren. Do activities that you know from experience your grandchildren find calming. Listen to music or read books with them. Find a funny movie and munch on popcorn. Play silly games. Keep things as close to normal as possible. Exercise is great for stress. My husband and I often swim, play sports, ride bikes, and jump on the trampoline with our grandkids – knowing it’s good for all of us. Last summer, we went on a relaxing camping vacation with our son and the kids and did a lot of hiking enjoying the peace and tranquility nature offers. Try not to be overly sympathetic or even worse, pessimistic. Avoid the attitude, “My grandchildren will never be the same.” Or think, “They will never get over this.” This kind of negative thinking will come through in your interactions. Rather. think positively: “My grandchildren are resilient. Children have a wonderful ability to adjust. My grandchildren will survive this divorce and develop strength and endurance that will help them later in life.” Let your grandchildren know that things are going to be all right. Tell your grandchildren about challenges you’ve faced and overcome in your lifetime. I recently lost my mother, but I want my grandchildren to see me as someone who is finding my way through grief, moving forward, and discovering joy and happiness again. I want to help them see they can do the same. Positive attitudes are contagious. So there’s my top five tips to help you and your grandchildren focus on the positive during a divorce. Try to be a real asset to them during a difficult time. They will thank you later. Images courtesy of David Castillo Dominici and photostock at FreeDigitalPhotos.net. This entry was posted in Baby Boomer, Grandchildren on August 11, 2016 by juliegorges. Last summer, we were fortunate enough to take a trip to Sequoia and Yosemite National Parks with our son and his three children. 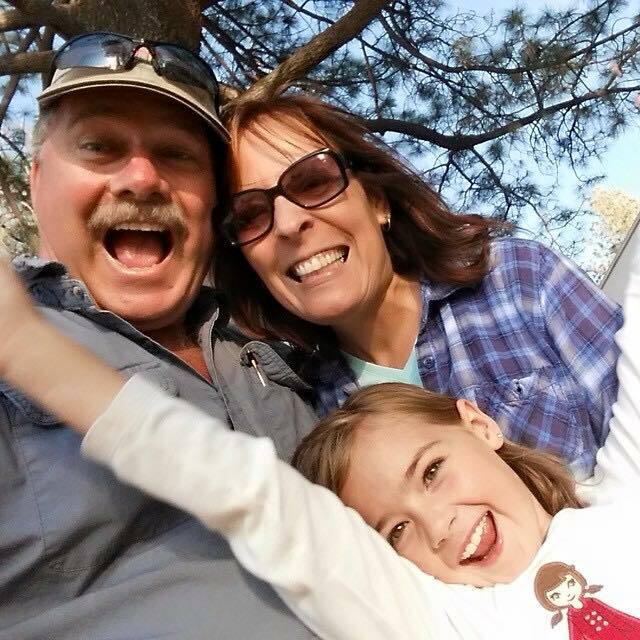 We camped, hiked, and swam with our grandchildren and a good time was had by all. Unfortunately, this summer we haven’t been able to get away. Plus, we live in the California desert where it’s super hot in the summer, so we’ve been forced to get creative. We can only swim so many hours! 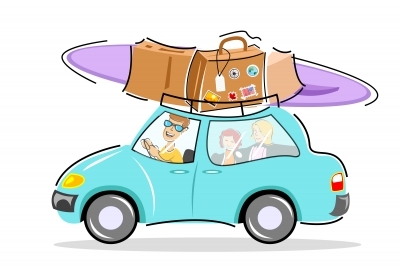 If you’re in a similar situation and the grandkids are getting bored halfway through their summer vacation, what are some simple but fun things you can do with them at home? When I finally got around to planting a garden at our new house, the grandchildren had a blast picking out seeds and plants. We made homemade signs and planted away. They are now are enjoying the fruits of their labor. My youngest granddaughter is the first one to run out to see what needs to be harvested when she gets to our house – but they all love it. (Of course, we have to do this in the evening hours here, but it stays light out until 8:00 PM right now.) If you don’t have a garden, take your grandchildren to a pick-your-own farm or your local Farmer’s Market to select some fresh produce for dinner. 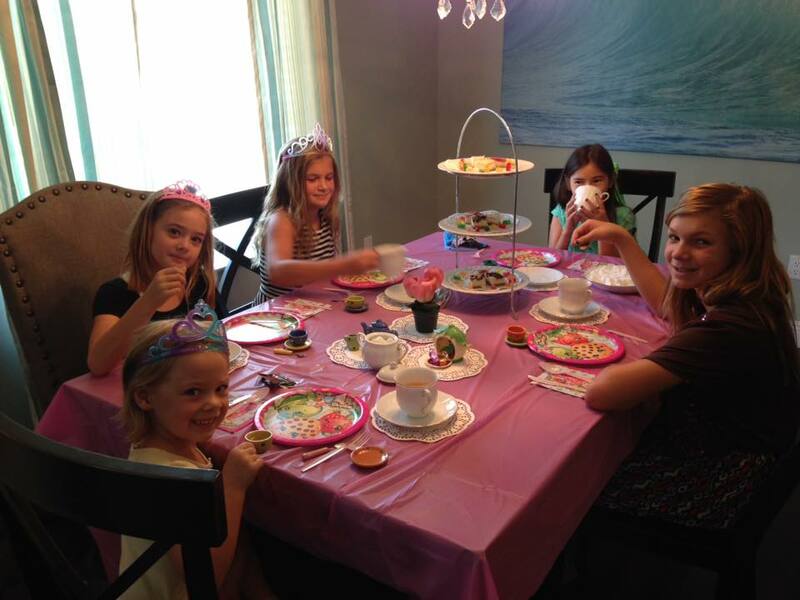 Last weekend, we had an old-fashioned tea party for my granddaughters. We visited the 99 cent store and picked up a very pink table cloth, Shopkin paper plates and napkins, some tiaras and tutus for guests, and princess rings for a treasure hunt. We invited a few guests and I put on an apron and served decaffeinated tea and juice, tiny sandwiches, and small pastries. Afterwards, we had a contest seeing who could throw the most tea bags into a teapot and who could stack sugar cubes the highest in 30 seconds. My 7-year-old grandson, Rowan, can’t get enough of board games. We’ve had fun introducing him to some of our childhood favorites like Sorry, Monopoly, Life, and Clue. Did you know they have a Star War edition of Operation? Think we may get Twister next. Card games like Go Fish and Old Maid work as well. For that, all you need is a basic deck of cards. Kids love learning about things that are new to them, but were “cool” a long time ago. 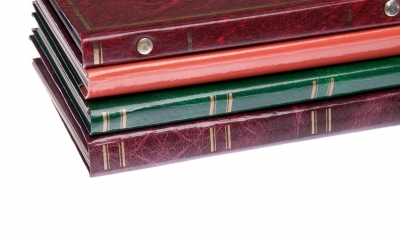 Share some stories along with a bit of family history. Show your grandchildren their parents’ baby books and photos – complete with tales about their first steps, first words, first foods, and all the mischief they got into as a child. Your grandkids will relish visualizing Mom or Dad as a pint sized peer instead of the person who tells them to clean up their room! When the kids have sleepovers or parties with their friends – this is always a hit! I make rhyming clues for them, but you can keep it simpler if you prefer. For example, turn an ordinary walk around the neighborhood into an exciting treasure hunt by giving your grandchild a list of things to find such as a red rock, a Y-shaped stick, or a bird’s feather. We did it as kids and your grandkids will still love it! Put on your bathing suits and run through sprinklers in the backyard. Or get creative. We bought a simple octopus sprinkler and put it underneath the trampoline in the backyard for squeals of delight. Or hook up a hose to a slide and put a small inflatable pool at the bottom. My granddaughters love this! 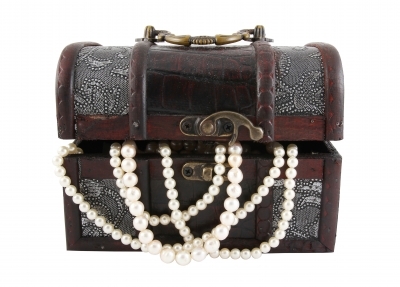 I have cherished jewelry my husband gave me, some jewelry I’ve inherited from my Mom, as well as inexpensive trinkets I’ve collected on world travels. Each one has an interesting story behind it and my two granddaughters, ages 9 and 5, love to hear them. Then I let them try on some inexpensive baubles so they feel like royalty. Grandpa, Daddy, and I all have stargazing apps on our phones. We hold our mobile devises toward the sky and the app identifies constellations, stars, and planets. We use StarMap 3D+, but there are many great apps – some are free – available. Some apps will tell you when the Space Shuttle is orbiting by your home or when the next lunar eclipse or meteorite shower will take place. Great stuff! Once again, there are tons of apps you can use or you can check out a book from the library. Learn some words and phrases, then travel to a place or nearby community that speaks that language and practice your newfound skills. My husband and I both know how to sign and have had fun teaching our grandchildren. They learn fast! The TV program, Signing Time on Netflix, is a great place to start if you’re interested in ASL. Tween and teens will enjoy the series, Switched at Birth. We’re fortunate to be in a sign language congregation, so the kids can practice with deaf people and learn more about their culture. We had a 60s anniversary party a while ago for my son and his wife. The grandchildren were invited and I got a hold of a Bozo, some Mad Men paper dolls complete with outfits, hula hoops, and a Lite Brite to keep them busy with theme-related toys. That was a few years ago – and they still play with those toys! All those classic toys you remember fondly like Lincoln Logs, Play Doh, Mr. Potato Head, Barbie, Spirograph, Slinky, and Etch-a-Sketch are still around. 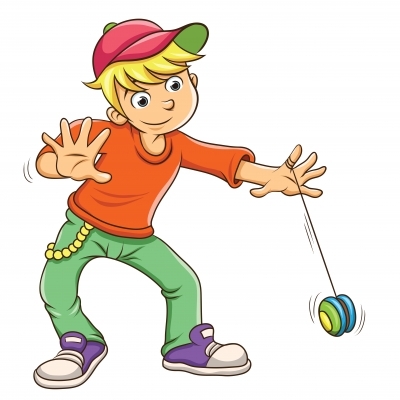 Purchase one of your favorite toys as a kid and go down Memory Lane with your grandkids. Or teach them how to fold homemade paper airplanes and have a contest to see whose flies the farthest. There you go! 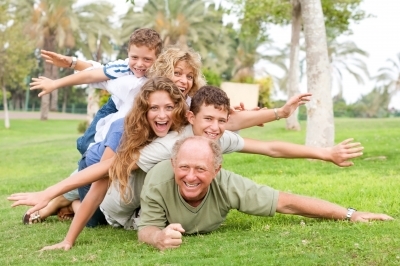 Ten ideas to get you started for some summertime fun with the grandchildren. And if all else fails, introduce the kids to an old-fashioned classic movie like Marry Poppins, Sound of Music, The Wizard of Oz, Singing in the Rain, Yellow Submarine, The Black Stallion, or the original Willy Wonda and the Chocolate Factory. Here we are watching Mrs. Doubtfire while chowing down on popcorn. 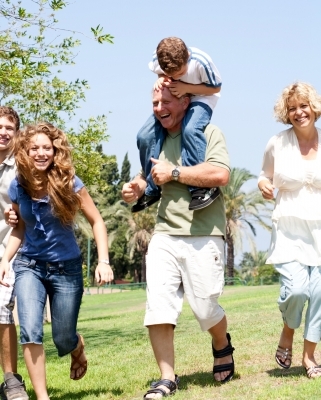 Have a great rest-of-the-summer with the grandkids! Images courtesy of photostock, artur84, Pong, and AKARAKINGDOMS at FreeDigitalPhotos.net. This entry was posted in Baby Boomer, Grandchildren on July 7, 2016 by juliegorges. Several years ago, I reunited with some of my old high school friends. The heartthrob and biggest flirt of our crowd was the first of us to become a grandparent. We middle-aged girls couldn’t quit giggling like teenagers when his grandchild called him Bopa! The whole thing was hysterical to us! Flash forward and now almost all of us are grandparents – myself included. We’re not only used to the idea by now, but true to our roots, we are determined to reinvent ourselves and be the grooviest, hippest, most involved, and greatest grandparents ever. We’re embracing our new role with the same excited enthusiasm we once had for macramé plant hangers and bell bottom jeans. So exactly how are we baby boomers different than our grandparents and how are we finding blessed baby boomer bliss through our grandchildren? If you haven’t noticed, our generation of hula hoops and tie dye isn’t exactly taking old age lying down. Gray haired baby boomers can be seen pedaling bikes uphill, kayaking, lacing up sneakers and heading to the gym, zip lining, scuba diving, and shooting jump shots. My grandchildren, ages 7, 5, and 4, are keeping me young and in shape and I’m loving every minute! I’m jumping on the backyard trampoline, playing volleyball, teaching them how to play tennis, and in general, my grandkids keep me running in circles. Heck, they are better than having my own personal fitness trainer! They not only keep me physically active, but mentally active too. Their silliness, creativity, and enthusiasm as they discover the world are contagious. And I know that’s good for me. Our relationship with our children was different than the previous generation. Haven’t we shared Facebook likes and Tweets with our kids? Now our grandkids are introducing us to a whole new world filled with new ideas and possibilities. As she pointed out in the article, we boomers are enthralled and embracing all the new gadgets like diapers with indicator strips that tell you if the baby’s peed or not, car seats that click into place, then morph into strollers with cup holders, and even the Snotsucker, a simple Swedish invention that takes infant nostril unclogging to a whole new level. As they get older, our grandkids keep us up-to-date with all the new cartoons on Netflix, Disney movies, and the latest video games. Aren’t we boomers accused of being self-centered? Of refusing to grow up? Maybe we connect with our adorable grandbabies and grandchildren on that level. At any rate, we’re not about to be left behind. We’re not even sure what exactly “generation gap” means. My three adorable grandchildren, ages 7, 5, and 4. As you can tell from my author’s Facebook page, where photos of my grandkids are proudly displayed on a regular basis, we boomers are blotto about our grandchildren. Yes, our grandparents loved us, but they didn’t seem to be quite as obsessed as we boomers are today with our grandchildren. I’m not sure why that is the case. Perhaps because many of us were working while we were raising our own kids in a world where we were trying to have it all. The freedom to spend quality time and be playful with our grandkids feels luxurious. Or maybe with the staggering divorce rates today, the new Millennials, who think of their parents as best friends, need our help and we are more than happy to provide it. At any rate, baby boomer grandparents are more engaged than their predecessors. So we boomers try and shut up and respect our children wishes. Hopefully, that makes us less judgmental and less likely to ask annoying questions such as, “Have you started feeding the baby solid food yet?” Or to make a critical remark about our child’s decision to not circumcise their son. Those are a few ways I think we boomers are paving new roads as grandparents. Agree? Disagree? How do you think boomers are different than previous generations of grandparents? I’d love to hear. Share your thoughts in the comments below! This entry was posted in Baby Boomer, Grandchildren on May 14, 2015 by juliegorges. Anyone who is a grandparent understands perfectly. When my first granddaughter, Eden Lillee, was born six years ago, I was unprepared for the instant connection I felt deep down in my soul when our eyes met for the first time. Of course, we all know grandparenting is much more fun than parenting. After all, you have all the enjoyment without all the responsibility. But it’s so much more than that. 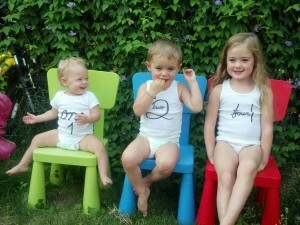 My grandkids and the joy of my life: Eden, Rowan, and Eden. When my grandchildren spend the night and I know they are in the next bedroom sleeping curled up in little balls, a warm glow of satisfaction pervades my body. The next morning, I quietly sip my coffee and anticipate all the soft morning snuggles with blissful baby smells soon to come my way. I must confess, as a young mother in my 20s, I remember feeling impatient and resentful of all the demands that parenting inevitably brings. At playgrounds, I’d restlessly stare at my watch, thinking I’d rather be anywhere else. Now, I can sit quietly and patiently, watching my four-year-old grandson playing with his tractors or my two-year-old granddaughter blowing bubbles for hours. I never tire of listening to my six-year-old granddaughter reading me books as she discovers one of life’s pleasures. Instead of feeling impatient, I feel grateful for the reminder that life isn’t always about duties, deadlines, and schedules. In my 50s, I am grateful to see the world in a simple way through their young eyes again. Studies link grandparenthood and life satisfaction, implying there is a long-run psychological benefit to the investment of raising children that skips a generation. I don’t need research to prove that fact. To be needed and wanted by these delightful creatures is a wonderful treat. Grandchildren are the living manifestation of who we are and what we’ve accomplished. They represent the best of what we’ve successfully instilled in our children and an opportunity to build on that heritage. Like many people, I find that the rewards of family life only grow richer and more fulfilling as each new grandchild is born. Be sure and spend time with them while they’re young. Invest the time now. Sure most of us still have lots of responsibilities, but take the time to change those dirty diapers and miss a few nights of sleep. Grandchildren who feel their grandparents played an important role in their lives while they were young tend to feel closer to them as they get older. Respect and get along with your own children. This isn’t the time to criticize parenting skills or go against your children’s wishes regarding family rules. We’re still working on trying not to spoil the grandkids – but we’re trying! Don’t make the mistake of having a “favorite” grandchild. All of your grandchildren have something unique to offer. Enjoy each of their little personalities with a profound appreciation for them as individuals. Stay healthy. 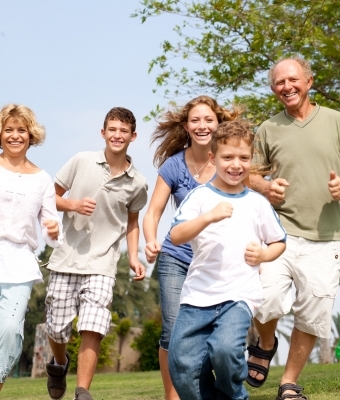 Grandchildren can be a wonderful inspiration to stay active and eat right. You’ll be able to enjoy more activities with them and chase them around the house as necessary. Enjoy the simple things in life with your grandchildren. For example, take an evening stroll with them. Listen to the cicadas. Take binoculars and look for birds. Teach them names of plants and flowers. Savor the sunset. Imitate your children and learn to relish the small things in life. What effect have your grandchildren had on your life? This entry was posted in Grandchildren on April 14, 2014 by juliegorges.